It is gathered that the Nigeria President Muhammadu Buhari’s aide, Lauretta Onochie, has dared former Vice President Atiku Abubakar to go to America to consult with Nigerian there over his Presidential ambitions. Atiku yesterday described the President Muhammadu Buhari-led federal government as incompetent, corrupt and disunited in handling the affairs of country and welfare of Nigerians at large. Onochie on via her Tweeter handle said; Atiku blasts Buhari, says his government most corrupt since 1999. LOOK WHO’S TALKING: Why is America enamored by President Buhari but dares you to enter their shores? Nigerians in America are waiting to be consulted too or are you going to ignore them? Atiku, while in Ebonyi state on Tuesday, July 10, 2018, said that the current administration is the most incompetent and corrupt since 1999. 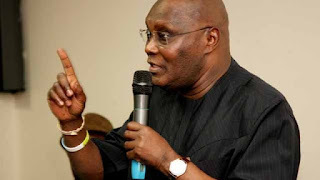 The former Vice-President also said that a lot of Nigerians are suffering under Buhari.Atiku Abubakar recently threw his weight behind the coalition of political parties working to sack President Buhari in 2019. The former Vice-President said the move will deliver Nigerians from the forces of retrogression, division and blame games.